Last week, my Nordic Ware addiction forced me to buy the beautiful Square Bundt pan. I had no control over the matter, my addiction took over. I blame the lovely Ebay seller who accepted my best offer on it. That was a bonus I really wasn’t expecting!!! I have to admit, when this pan first came out not too long ago, I really didn’t like it. The more I saw it though, the more I liked it. I think I was just so used to the stunning round pans, that to me this one was just wrong! But now I take all that back as it is one of my favourites already. I love it! A word of warning though… I discovered it is ridiculously hard to find a square cake stand and it took trips to a lot of shops over several days before I finally found the one in the photo. Thank you Debenhams sale! The wonderful people at Kitchens Cookshop (who are a big supplier of Nordic Ware pans here) have told me they are working on stocking some too. You’ll know from a previous post (the Rose Madeleines) that I adore rose flavoured things, and Turkish Delight is one of my favourite treats. Not the chocolate covered stuff… that’s sacrilege!! I mean the type you get at Christmas in a box with a ton of icing sugar on top. Heaven! My wonderful Other Half recently abandoned me and went on holiday with his friends to Turkey. Needless to say, he came home with plenty of really delicious Turkish Delight as a present for me. There were all sorts of flavours, and different ingredients used to coat them. No icing sugar, instead it was desiccated coconut on some and cornflour on the rest. My favourite though will always be rose. Feeling inspired with the yumminess of the cubes of Delight, I decided to make a bundt, and it had to be the square shaped pan to tie in with those cubes. I decided to make rose and lemon, just like the flavours we mainly have here. This recipe is completely my own invention. I made it up as I went along but I have to confess, it is delicious! The cake it produces is moist and incredibly light. The Square pan is a 10 cup one and this recipe made a bundt which rose right to the top of it so caught all the detail of the pan. At one point it did look like it wasn’t going to stop rising, but miraculously it did just at the right moment. Phew! I get asked a lot about what I use to grease the pans. I only use Wilton Cake Release, and I brush it on with a pastry brush. 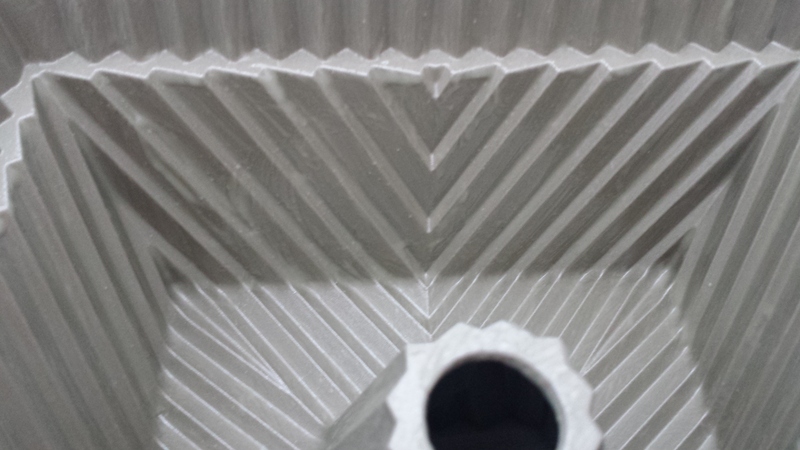 This is the inside of my greased pan ready to use. I will be making this one again and again as it is my favourite so far. In a first for me, I’ve received orders from 2 people asking for me to make it for them too! I’ve never been asked to make a bundt before! Happy days 🙂 Hope you like it as much as I do! Preheat the oven to 180C. Prepare your bundt pan by brushing Wilton Cake Release into every little nook and cranny. In a large bowl, beat the butter and caster sugar together until pale and fluffy. Add the lemon zest. Gradually add the beaten egg, mixing well between each addition. Stir the rose water in to the buttermilk. In another bowl, sieve together the plain flour, baking powder, bicarbonate of soda, and salt. Tip half of this into the cake mixture and fold in gently with a large metal spoon or a large spatula. Add the buttermilk mix and continue to fold in gently. Finally add the rest of the flour and fold in until the mixture is smooth. Be gentle though, you don’t want to overmix it. Pour into your prepared pan and use a spatula to spread it evenly around. It will fill the pan three quarters high. Bake in the middle of the oven for about 30-35 minutes until golden, well risen, and a skewer inserted into it comes out clean. Leave to cool in the pan for 15 minutes. While doing this, prepare the syrup by placing the lemon juice and icing sugar into a small saucepan over a low heat, and stirring until the icing sugar has dissolved and the mixture is just starting to boil. When the bundt has cooled for 15 minutes, turn out on to a wire cooling rack, and immediately brush the syrup all over it gently. The syrup will soak straight in. You won’t need all the syrup for this, unless you like a really intense lemon flavour!!! Just one coating all over is enough, not forgetting the middle section! Leave to cool completely. When cool, place on to your cake stand or plate. Mix together the icing ingredients until you have a thick but slightly runny icing. Add more water if you want it a but runnier. Pipe or spoon the icing on to the top of the cake, letting it run down the sides a bit. Use a sieve to sprinkle a little bit of icing sugar all round the sides, just enough to highlight the beautiful pattern. 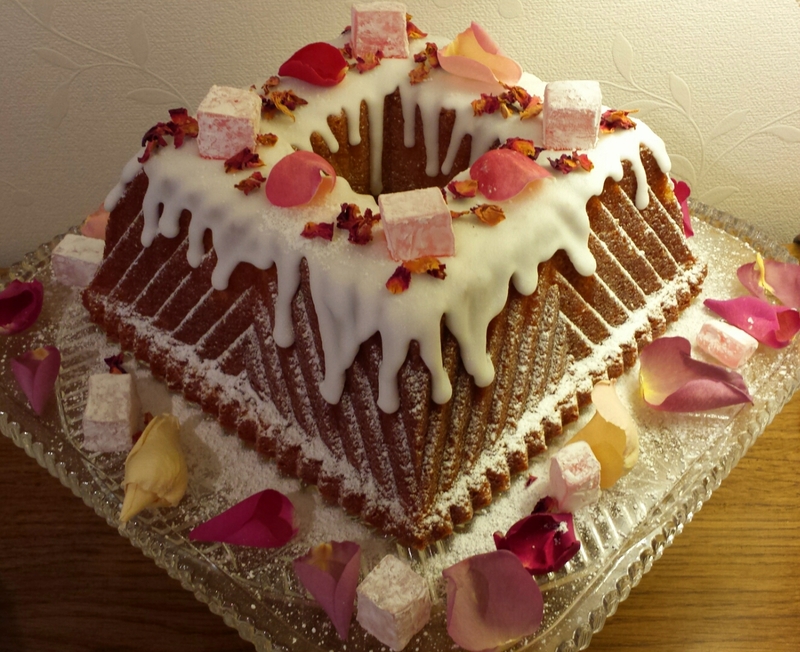 Decorate the bundt by placing rose petals and Turkish Delight on the top. Oooooppss!!! Nearly forgot the exciting part! 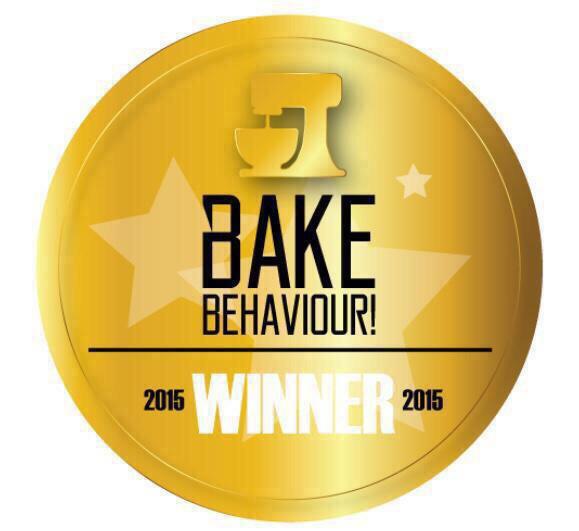 Every weekend, Bake Behaviour asks people to send in their photos of their bakes and they choose two to go forward to try to win the much-coveted Golden Mixer Badge. People on Twitter then choose which they want to win. Well, I entered this bundt and……………..it won!!! Yippee!!! « Nordic Ware Shortcake Basket Pan Waffles! Beautiful cake and cake tin! 🙂 Nice to see Turkish delight used as decoration too..